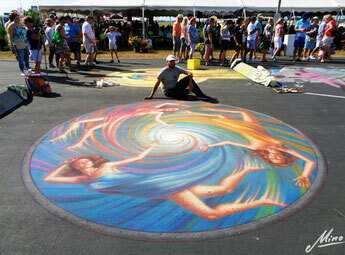 Again this year I had the pleasure of participating to Chalk Festival in Florida, in the city of Venice that overlooks the Gulf of Mexico. Yes, I bathed to sea, let’s say that between small shark and jellyfish, it was nice. The theme of this edition, the tenth, it was “Evanescence”, refered to these two between evanescence and eternity of the “madonnara” art, whose artworks start to fade when the job’s done and whose remain lasting emocion gave. For my work I wanted to confront the origin of anything,the three primary colours: the yellow, the blue and the red. These last have materialized in three subjet, that are sucked into the whirl of the evanescence and walked into the eye of the storm, in this place from the union of the three primary colour, the white colour is generated and the light, mother of each colour. The work is of circular shape and it was particular felt by the visitors, beacause they have looked to turn around to it, entering themselves into the whirl. For children it was like play, and I hope a emocion to remember. In this Festival I had the opportunity to review those friends from anywhere in the world, which I was able compare me artistically and to exchange new ideas, as well as top secret anecdotes. We all wanted to meet again, of reload the batteries of new impetus and motives. How did I communicate? With the italians in italian, with the south american friends I showed my spanish competent, with the american friends… great hugs… that’s over hundred words spoken in five seconds that I not undrestand it. In the last day of the Festival there was no one to paint about artwork; don’t seeing my friends on ground to work was like those artwork missed the soul. I thank very much the director of the Chalk Festival Denise Kowal and all volunteers, for a great deal of goodwill and kindness, we are a family. I also thank Chiara, model who sacrificed your backside for my work, I believe that sooner o later she will ask me some damage, also moral.